I’ve only been in the floral business for about 6 years. My in-laws own Achara Florist, and needed someone to work in the gift part of the store. Once I started working with some of the amazing designers, I began to design a little bit myself. I found that I love creating beautiful flower arrangements…and the rest is history! Gosh, I love them all! There are too many to count. But if I had to name a few, they would have to be peonies, hydrangeas and stock. Peonies smell extremely and are just so beautiful. They take center stage in whatever you put them in. Hydrangeas are nice, big gorgeous flowers that I love to use in wedding work. They make bridal bouquets nice and full, and they go with other flowers so well. Stock is another one of my favorites because it comes in all different colors, and has a wonderful fragrance and big, thick blooms that are stunning in everything. Can you tell us a little bit about Stafford, VA? What is your favorite thing about living there? The stone that was used for many of the government buildings in Washington, D.C., including the U.S. Capitol and the White House, came from Government Island located here in Stafford, VA. That is one of the things many people do know about our town. The people here come from all over, so we have a very diverse population. We are far enough from our nation’s capital to still be a little country and a little city at the same time. And that’s what I love about living here. It’s the best of both worlds! Knowing that I had a part in making someone’s day. I had someone ask me to make a flower arrangement to resemble the movie poster for “Warcraft.” It was a strange request, but I did it! I made a sword out of bamboo and sprayed it silver, then put red roses on one side with blue delphinium on the other. It turned out perfect! They were very pleased. I love weddings. Being able to bring beauty to that most special of days for a couple so in love is just the best feeling. But I also love funeral work. I feel very honored when someone asks me to do the flowers for their loved one’s service. Being able to bring life to memories through someone’s favorite color, flower or smell is a great feeling. 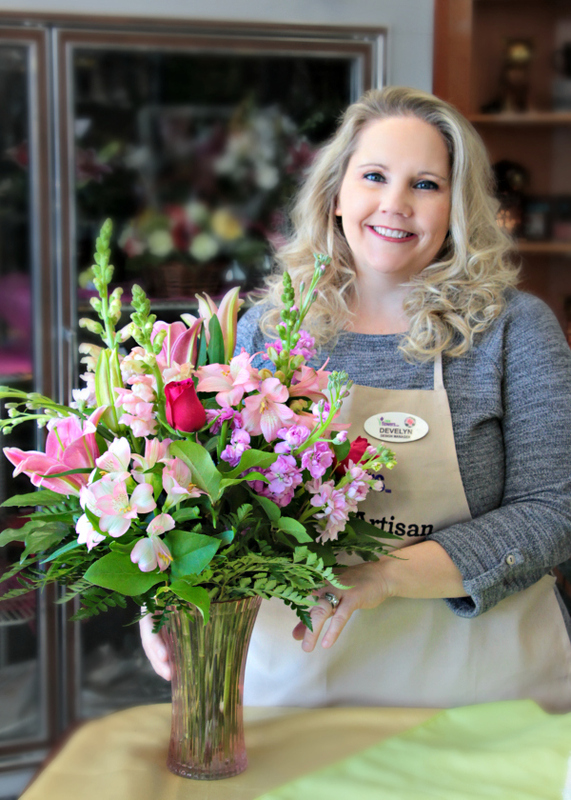 What inspired you to design your Local Exclusive arrangements? I was inspired by the beauty of flowers. To be able to create so many different arrangements using flowers that come from all over the world is truly a blessing. What is your favorite Local Exclusive design that you’ve made and why? It would be Sensational Spring Beauty™. It has everything: white lilies, pink and yellow snapdragons, yellow and lavender roses, pink Gerberas. It’s breathtaking! The people! We have good-hearted, caring people here in Stafford. You are always met with a smile everywhere you go. I love all things mythical. It doesn’t matter if the book is about vampires, fairies, dragons, werewolves etc. I love them all. I’m always reading something about that world. Now, do I believe they’re all real? Maybe I do. Maybe I don’t! My family! I am truly blessed to have the most amazing husband and the best five boys a mother could ever ask for. They make me laugh until I cry. They drive me nuts. And they love me endlessly.